The mother who should undergo a cesarean section delivery time, it takes longer to recover. This sometimes becomes more severe, when Bunda less got support or hear a variety of comments were negative. Do not worry, because there are several ways that could Mother do to recover faster after surgery of the Caesar. Recovering after a cesarean section is different than recovery after childbirth with the normal process. After Caesar, the mother needs to stay a little longer in the hospital, about 3-4 days. In addition to the somewhat difficult walk and get out of bed, the mother may also find it more difficult to defecate. May our Lady including from most mothers who so wish and strive to give birth normally. So, the mother felt disappointed when doctors decide to perform a cesarean section. These feelings can continue to get carried away until after childbirth and the recovery period affected. Especially if the people who come to see the ask, "Why gave birth by cesarean section?" The mother needs to sort out where the comments that need to be heard and which are not, even if it was uttered by people who respect the Mother. If it is felt can be calming, the mother could discuss feelings of Mother with people near the mother of believers. The mother needs to accept the fact that there are certain conditions that make a cesarean section is more safety in our need for mother and baby. Undergoing cesarean section also makes no less Mother struggling as the mother or undergoing labor less than ideal. Experience the baby blues after childbirth, a common occurrence, either on a mother who gave birth normally or Caesar. But if this happens weeks or prolonged, we recommend consulting a doctor or psychologist to get treatment. Do not let these negative feelings making Mother can't take care of the little one or are thinking of hurting yourself. The most important thing, do not need to compare the condition of the Mother with other people. For example with colleagues or relatives who gave birth to a normal or faster recovering after cesarean section. The condition of each person is different. The most important thing is to focus on the health of the mother and the baby, so he gets the right nutrition and parenting. The day after surgery, the stitches will be area definitely felt the pain, but it will subside in a few days. Likely the doctor will prescribe a pain reliever and a laxative so Mother easier bowel movements. Don't forget, the mother will also need to drink enough water, Yes. The mother needs to care for cesarean section scar from the risk of irritation or infection, a drug that has been prescribed by a doctor. Wear loose clothes, especially pants that don't swipe your scars. During breastfeeding, the mother can put the baby on a pillow of breastfeeding to reduce pressure on the stomach. If wound pain is normal or not, check with your doctor immediately. Despite having a newborn makes the lack of sleep, but aim for adequate rest periods. The mother can sleep for babies also sleep. It is important that the body of the mother quickly recovered after surgery. The mother is indeed advisable to simply take a break, but that does not mean to sleep all day. Thus in order to quickly recover, the mother needs to remain the activity, though not excessive. The mother can walk regularly, for example, walk in a residential complex, to help restore the body's stamina after cesarean section. In addition, do a light stretch calves movement and Flex the legs, to improve blood circulation in the legs. The mother can also do Kegel exercises to help restore the pelvic floor muscles. Ask the doctor exactly when can be back exercising and work. This can be different for each person, according to the health condition of each. After cesarean section, avoid lifting heavy objects, at least during the first two months, to keep former stitching remains secure. Also avoid first up and down the stairs. Listen to your body and stop if the mother is considered the activity already exceeds the ability of the body. Place all the need within reach of the mother, such as baby diapers, drinking water, and food. In addition, it is important to receive help from the husband or relatives to help the mother care for the little one and take care of the needs of the home. In order to quickly recover, the mother needs to consume vitamin C rich foods and drinking enough water. In addition always to provide healthy snacks to snack in between meals. Nutrition through a variety of fresh and healthy food is also important for nursing mothers. 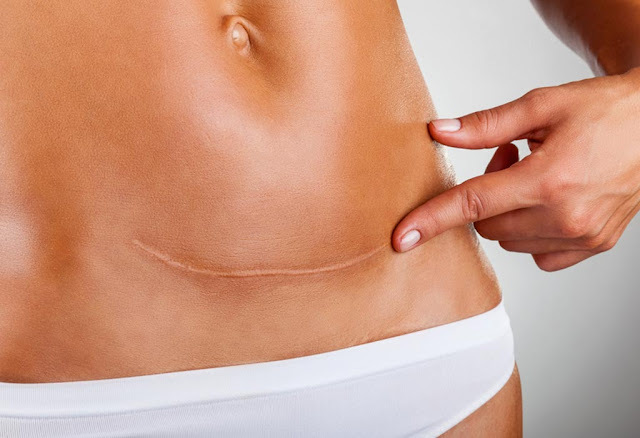 So don't let the negative comments or hinder the process of recovery after cesarean section. Do the ways above and check with your doctor at regular intervals. Hopefully not soon recover Yes, mother.